Stacy Tilton Reviews: Pretend & Play - Gifts every child will love! Pretend & Play - Gifts every child will love! I can still remember when I was growing up having my own little doctors bag with all the little miniature doctor tools inside of it. I thought I was pretty big stuff carrying around that bag, and using the tools to "operate" on my poor hurt dolls. Pretending and playing is something kids learn very early on and with the right help they can learn about so many people that may impact their lives at some time in the future. If you ask me it teaches them how hard some jobs can be when they see all of the tools necessary for a person to do their job, and it teaches them to appreciate those people. Of course above all else it's important to just let them pretend and have fun being their own little creative selves. 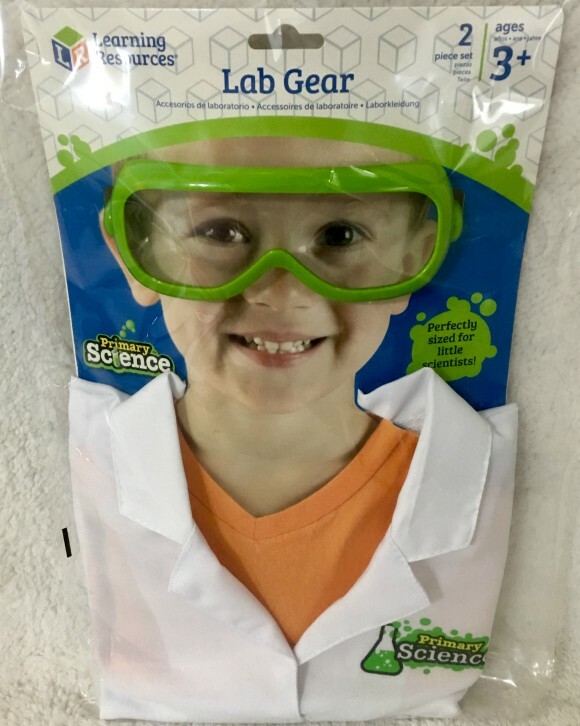 These pretend and play sets are the perfect way to help kids do just that. Each set has a theme and includes all the basics needed for a child to pretend they are the person or doing the activity from the set. I love that all of these sets come in a a corresponding case of some sort to hold all of the pieces. There's nothing worse than having a pretend set and nothing to store it all together in. I can still remember my daughter being broken-hearted over losing pieces from one of her princess sets because it didn't come with a bag and the parts ended up here and there in her room. You can check out all of the features and contents of these sets below as well as find links to where you can purchase them online! 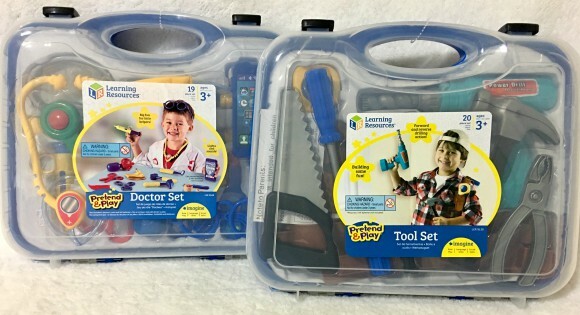 The Pretend & Play® Doctor Set features enough medical tools for the whole junior surgical staff to operate! Made from sturdy plastic, this set features a battery-operated stethoscope, and realistic sounding cell phone. Provides the perfect way to ease children’s anxieties about doctor visits. Includes: Stethoscope, Cell phone, Forceps, 3 bandages, Eyeglasses, Name tag, Scalpel, Thermometer, Tweezers, Syringe, Blood pressure cuff, Scissors, Reflex hammer, Bedpan, Ear scope, and Dental mirror. Plastic carrying case has a place for everything and provides great storage. The Pretend & Play® Work Belt Tool Set has everything young builders need for a day on the job! Inspires imaginative play about big construction jobs or home improvement projects with Mom and Dad. Includes: Hammer, Saw, Tape Measure, Nuts, Bolts, Board, Battery-powered Drill, and Tool Belt. This 20-Piece set is made of durable plastic and stores in a sturdy carrying case. Drill requires 2 AA batteries, not included. Get your style on with New Sprouts® Style It! Look your best with this perfect styling set. Style enthusiasts can express themselves with this colorful collection that includes a hair dryer that makes familiar whirring sounds and a mirror. Tools are sized perfectly for little hands, and a handy caddy keeps all essentials (including a brush, flat iron, and shampoo bottle) organized and ready for your next new hairdo. Vinyl caddy measures 5¼"H x 8¼"L.
With the Pretend & Play® Fishing Set, reel in the big one! Bait the line to catch fish in 3 sizes. Little fishers role play hooking this catch of the day just like the family’s grown up fisherman. Catching and releasing has never been this fun! All pieces store in the sturdy plastic tackle box. Activity guide features 6 pages of fishing themed activities. Fish are caught using magnets that are embedded for safety. Includes: Tackle Box, Vest, Fishing Pole, 3 fish, 3 worms, Net, and an Activity Guide.